How to create bolt connection in bulk (once for all)? rather than to create one by one. In chassis, we have almost more than 200 bolts so it is very difficult task to add connection one by one, which is very time consuming. So is there any other way or workaround to create bolt connection in bulk. Re: How to create bolt connection in bulk (once for all)? rather than to create one by one. if bolt placement locations were created using pattern functionality then you can assemble single bolt and apply reference pattern on it. This will help in some amount as always we need to provide reference edge for placement always. Please can you send me any userguide or help document to try this. if you ask Google creo reference pattern, then you will get for example https://www.youtube.com/watch?v=cH-ONgCG9e0 link. Another way is to create a Component Interface (basicly one half of a constraint) on the bolt, then use that Component Interface to place your bolts. 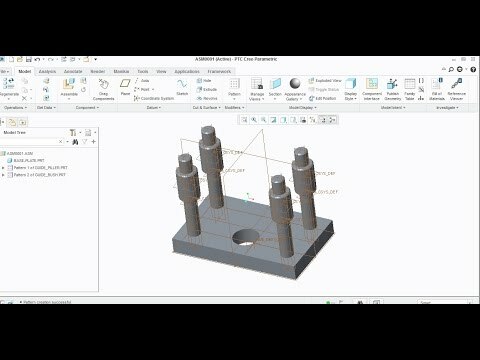 If you are trying to create bolts for simulation, then you can only copy-paste for each hole. I hate to bring it up, but SolidWorks can do this for bolt simulation, copy all of the fasteners at once for the same size bolt. If you are wanting to create all of the bolts at once without simulation, then you can use IFX.